10 Feb 2005 - have replaced all the patent number links with stable URLs. pg 16 - There is a mistake in that the book says the most important contribution of Joseph Henry was to sectionalize the electromagnet coil winding into sections. But that's far from the case. The KEY thing Henry did was to insulate the wire he used. All prior work with electromagnets uses bare wire. Henry used his wife's spinning wheel to cover "Bell" wire with silk. Note "Bell" wire was not the name for electrical wire used to ring doorbells as it is so named today, but rather it was wire that was routed using pulleys mechanically terminated in bells that rang when the master pulled a cord, hence "bell wire". 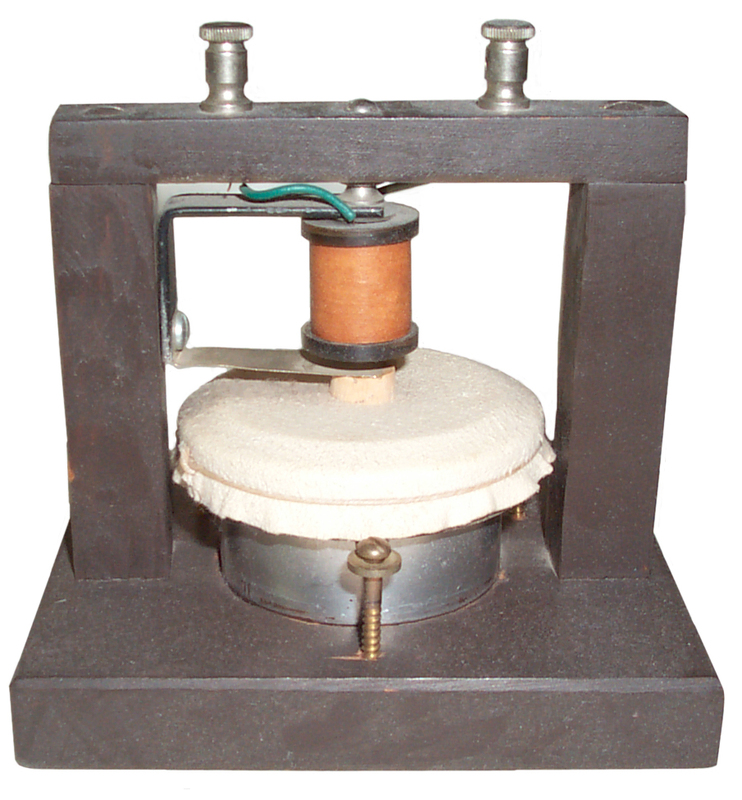 234744 Microphone, Emile Berliner, Nov 23, 1880, 381/178 - couples microphone to induction coil to transform impedance, can be used by Bel Tel with Blake carbon mike patents. For about 40 years the telegraph was THE way to send a message quickly. Bell was working on a way to allow multiple messages to be sent in parallel over a single wire by using different audio frequencies for each message. Today it would be called FDMA, Frequency Division Multiple Access. In the process he realized that voice could be sent over a wire. This required the invention of the microphone and the invention of the speaker. 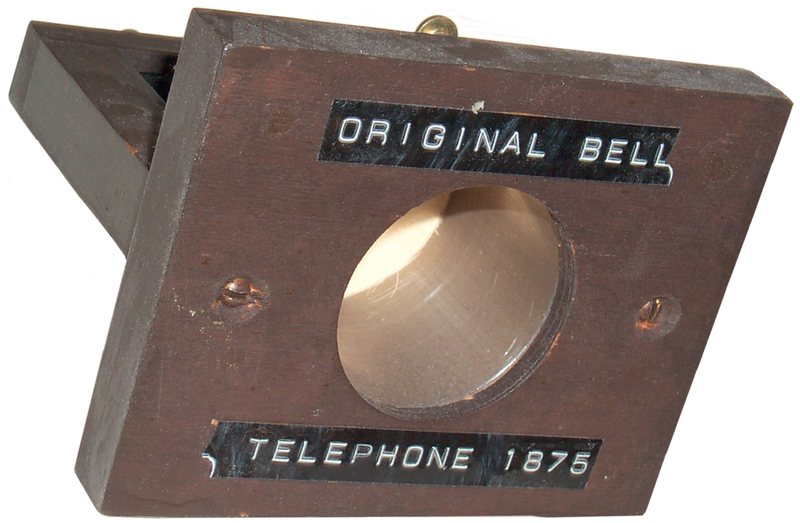 The device in the bell patent works as both a microphone and a speaker. See the Leclanché Battery web page for those and related patents. See the Gamewell Fire Alarm Street Box for more on Pen Registers. Note that the Gray patent title is Electrical Telegraph for Transmitting Musical Tones not some new term to describe telephony. 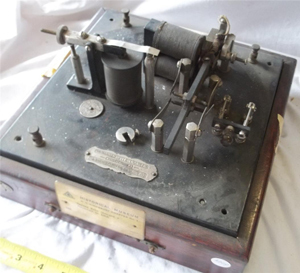 Gray thought he had a patent on an improvement to telegraphy. The single class number is 178/47 which is for Telegraphy/Harmonic or reed. 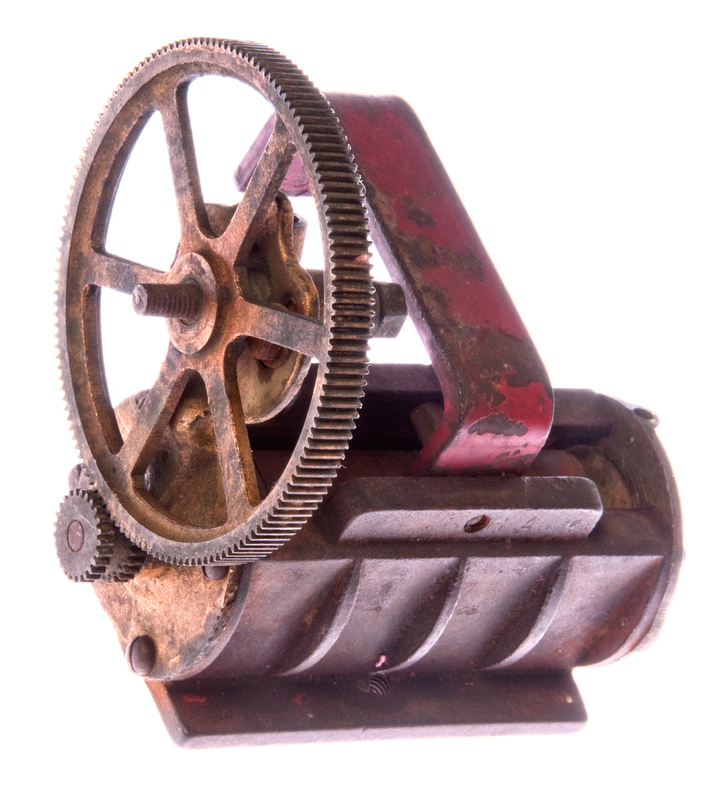 First generation Local Battery operation with hand crank generator signaling. 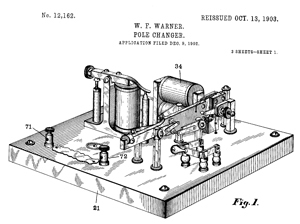 174465 Telegraphy, A. G. Bell March 7, 1876 379/167.01; 178/48 - sending sounds over wire "The most valuable patent ever issued"
Included in this patent are the Gallows and Liquid phones. Both are combined dynamic microphone/earphone types. The primary class number 379/167.01 is for Telephonic Communications/ Private (e.g., house or intercom) or Single Line System. Is patent 174465 also the first patent for a speaker - earphone type device? yes. 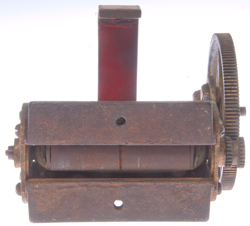 Note that the coil and terminals looks just like those used in telegraphic sounders. For more on this phone, see my phones web page. Remember that at the time the patent titles were commonly the same for the same patent class. For example out of over 400 patents related to the stock ticker machines the vast majority of them are titled "Printing Telegraph". Since patent class 379 to telephone related invensions did not exist then the only class that mase sense with 178 for Telegraph Equipment. So although it looks strange today to see "Telegraph" as the title on a patent for the telephone, at the time it was about the only choice. In 201488 it says the rod in this patent can be a magnet. The main idea is to close the magnetic path so that there is only the gap to the diaphragm. Unknown Magneto generator, missing the magnets. Where would they go? Is red bar supposed to be a magnet? Note only one hole at top of this pole. 3 holes on top of front pole. Output is between case and shaft at center. Manual telephone exchanges used electric bells as a way to get someone's attention. These required AC at about 10 Hertz (then called Cycles Per Second or CPS). 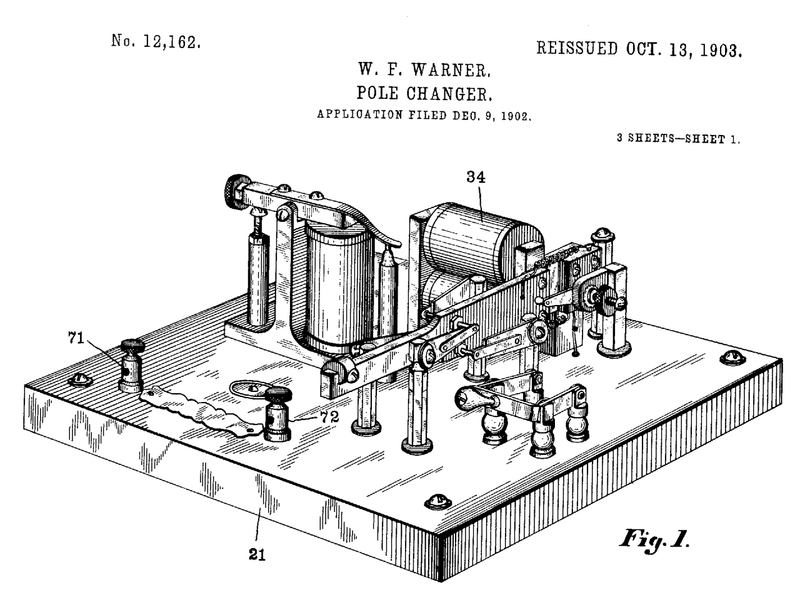 The "pole changer" was a device that converted a DC battery voltage into AC ringing voltage. AGB's patent 174465 was for a combined dynamic microphone - earphone - speaker device. But the granular carbon mike was the common microphone used through the 1950s for telephones, military radios, and many other microphone applications. From 1950 to the present military radios use dynamic mikes. Second generation system using Common Battery signaling, and sometimes common battery power for the carbon mike. 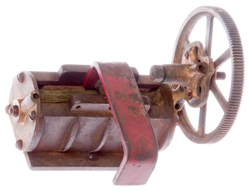 Web page devoted to this carbon type transmitter, a patent that took 15 years to grant. This is newer than the T.A. Edisno carbon mikes and is the one used by the millions. This patent purchased by Bell Telephone in 1901. Started looking for a replacement for shellac (Wiki) and announced Bakelite in 1909. Patents by Leo H. Baekeland. D159188 Telephone Set, Hiram D. Currier, Leich Electric Company, Jul 4, 1950 - a 302 telephone with the dial replaced by a hand crank? 4823379 Telephone ringer 379/373.01 ; 340/397.5 - This is an example of something that looks like a good idea. BUT . . . the way it's been manufactured it's so fragile that age or dropping the phone breaks the plastic parts. So professional phone installers avoid any phone that contains this ringer like the plague. Forth generation, and now current, switching. USPTO Classification Numbers Relating to "Telephone"
Page Created 6 July 2003.